Chicken satay is a popular Thai dish which, when made in the traditional way, involves many ingredients and plenty of effort. Using an authentic prepared version leaves more time to concentrate on a fresh-tasting, crunchy cucumber salad to go with it. Reheat the satay according to pack instructions. Meanwhile, use a sharp knife to cut the cucumber in half lengthways. Using a teaspoon, scoop out the seeds and discard. Cut the cucumber into 3mm slices. Place in a bowl with the red onion and salad onion. Combine the dressing ingredients in a bowl. Pour over the cucumber and onions and mix well. Cover and place in the fridge for up to 3 hours, or until ready to serve. Just before serving, roughly chop two thirds of the mint and all of the coriander. Mix into the salad, together with the remaining whole mint leaves. 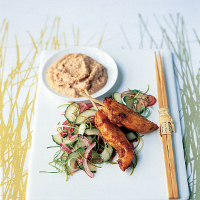 Serve the hot satay on a bed of cucumber salad with the satay sauce (provided with the satay) for dipping. Transport the salad in a well-sealed container and chop and add the herbs at the last minute (they will discolour after chopping if not used immediately). Cook the satay at the party. Leasingham Magnus Riesling, Clare Valley, S Australia, £7.99. The spicy, slightly sweet flavours of both starters need a ripe, limey, mandarin-fruited white such as this New World Riesling.